Trekking adventures on the Larapinta Trail since 1995. Trek the Larapinta Trail with the pioneers. Small Group guided adventures and Self Guided trips available. Expert guides, award-winning Campsites, leaders in responsible Travel. Book your next visit today. Search through our range of Larapinta guided and self guided treks, ranging between 3 day to 14 day treks along the Larapinta Trail. Whether you're an independent walker or want to walk as part of a group, browse our selection of larapinta treks and choose the one that's right for you! Why walk the Larapinta Trail? The Larapinta Trail is one of Australia's finest walks, situated just out of Alice Springs and spanning 223kms across the West MacDonnell Ranges. Divided into 12 different sections that can take between 12-14 days to complete, it is an unforgettable walk in Australia's Red Centre and is an experience that will stay with you for years to come. Experience the scenic highlights of the trail, from the big blue skies that offer a stunning contrast against the sunburned landscape of the ranges, to some of the most spectacular geological formations in the region. Described by Australian Geographic as "one of the world's best long-distance arid-zone walks", this spectacular desert trek traverses the ridgelines of the West MacDonnell Ranges from east to west. Situated in Tjoritja, also known as the West MacDonnell National Park, the trail includes many sites sacred to the Arrernte Aboriginal people, with highlights along the track including Simpson's Gap, Ormiston Gorge, Ellery Creek Big Hole, Mount Sonder and more. The diversity in the West MacDonnell Ranges offers an exceptional chance to experience Australia's outback wilderness, home to nearly 600 species of flora, as well as birds, native wildlife and fascinating geological formations. Picture meandering through spacious gaps and sheltered gorges, rugged ranges, swimming in cool waterholes and sleeping under the stars. There's no doubt that the beauty and grandeur of the Larapinta trail will stay with you long after you visit Australia's Red Centre. We acknowledge and thank the traditional land owners, the Arrente people, for allowing us to walk on and enjoy this sacred land. The Ecotourism award recognises ecologically sustainable tourism with a primary focus on experiencing natural areas that foster environmental and cultural understanding, appreciation and conservation. How do you want to walk the Larapinta Trail? With the introduction of self-guided treks in 2016, today we are proud to offer more walking options on the Larapinta than any other company. With 3, 6, 9 and 12 day self-guided treks, you can walk at a pace that suits you. Alternatively, join on one of our guided treks and experience this iconic desert landscape with our professional and experienced guides. On the three and six day treks, stay in our exclusive and award-winning semi-permanent campsites for a comfortable wilderness experience soaking up the surrounds in an idyllic natural setting. If you’re looking to challenge yourself, book on our 9 or 14 day guided tours and stay in wilderness campsites on an adventure of a lifetime. Why travellers are choosing to walk the Larapinta Trail with us? 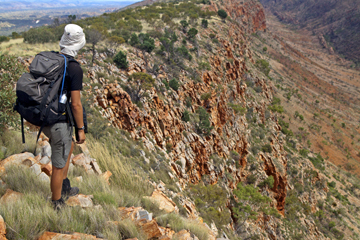 World Expeditions pioneered the very first trek along the Larapinta Trail in 1995, and since then has been leading the way when it comes to experiencing the beauty of the West MacDonnell Ranges. With over 30 years experience, we are passionate about giving back to the community and showcasing the beauty of Australia's Red Centre in the most sustainable and eco-friendly way possible. We offer 12 different ways to experience the Trail, from guided walks with our professional wilderness guides, staying in our exclusive semi-permanent campsites or wilderness camping, or self-guided treks that take the hassle out of transport, food and logistics. Our four award-winning semi-permanent campsites provide heightened comforts, including a large communal tent, hot showers, an ablutions tent, and large ‘safari style’ sleeping tents, and have a minimal environmental footprint. These are attracting much positive feedback from our travelers, and considering all the quality inclusions, our Larapinta In Comfort treks provide the best value in the market. Our professional team of knowledgeable and caring guides gives our travellers an incredible experience and is part of what make our treks so special. Learn about the flora, fauna, fascinating geology and history of the land from our guides, who are passionate and have extensive knowledge on the area. I set out for a walk and came back with the experience of a lifetime. An educational and cultural experience. Extremely well organised with experienced, knowledgeable and compassionate guides. A fantastic trip, made all the better by the knowledge, skills, experience and commitment of the guides! They were great company, careful of our individual needs and abilities on the trip, and happy to share their knowledge and understanding of the local people and environment with us. I enjoyed all aspects of the trip and was very impressed by our guides who kept us safe, informed us, challenged us, fed us and managed logistics all with wonderful care and good humour. The landscape was amazing and I really enjoyed learning about the geology, vegetation and birdlife as well as the cultural significance of the places we visited. It was a great trip! The most memorable part was the scenery, the landscapes, and top it all off was the magical sunrise from Mt Sonder, the guides because they were very experienced, they knew what they were talking about, and the great cooks too - always very polite and helpful. The people I went with also made the trip memorable and unforgettable. 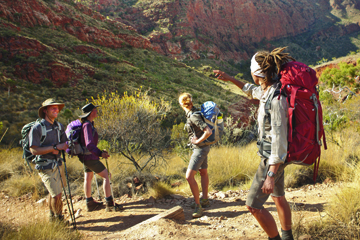 Australian Walking Holidays specialises in small group wilderness adventures, including the Larapinta Trail. We are part of the World Expeditions Travel Group. World Expeditions holds an Air Travel Organisers Licence (ATOL) No. 4491 issued by the Civil Aviation Authority (CAA).